Parilla is every day Argentine food served on virtually every city block of Buenos Aires. The cuisine is simple and naturally flavorful, cooked over a large charcoal or wood fired grill. Almost every interior part of a cow is available on the menu, from liver, kidney and intestine, to the usual tenderloin and strip steak. Temperature is never asked, and the beef is always perfectly tender, with juices marinating each bite. There are other meats and sausages on the menu as well as the option of indulging in a salad bar. It is a no-frills dining experience. Fresh, hand cut, grilled steak on a plate or stainless steal platter, along with what ever you want from the rows of vegetables. It is simple and delicious. Chimichuri is a sauce, or salsa, which comes in a variety of blends that the house chooses. Chimichuri is most commonly red or green. The red seems to be a combination of fresh garlic and onion with chili powder and a mild crushed red pepper all steeping in light blended oil. The green has a varity of fresh herbs along with the garlic, onion and oil to give it its verde salsa look. It is designed to be atop meats, it frequents salads and dinner rolls as well. As mentioned the flavors are simple and decadent. There are few options other than chimichuri and salt to season your meal. The salad has the option to be dressed with oil and balsamic or cider vinegar. If you are an A1 Sauce or ketchup person try an American steakhouse. The chicken is one of the least expensive items on the menu. Called Suprema de Pollo, or Pollo a La Plancha, it is a grilled butterflied chicken breast that tests the size of the plate. It has no more flavor than salt, and smoke, but each bite is tender without a hint of dryness. A seasoned option at a parrilla would be the sausages. Your mouth practices its job in the digestion process as they approach. They are stout and fresh. The seasoning is still mild for a sausage, but perfectly complimentary to the pork. There are few things as pleasing as a fire roasted sausage when in the mood. 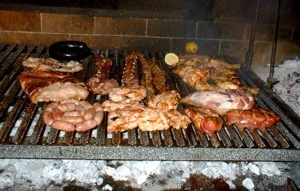 Similar to the food itself, the atmosphere of an ordinary parrilla has no embellishments. There are some pictures or paintings on the walls that attract no attention. The lights are bright letting the cleanliness of the establishment be known. The tables and chairs are just that, tables and chairs. There are more elegant interpretations of parrilla, they are not on every street corner however. If the opportunity is there, try and sit at the commonly featured bar facing the grill. This gives face-time with the person who is cutting and cooking your steak. If you would like to bother asking the chef for a recommendation feel free, but his answer will be the Bife de Chorizo. Similar to an inch-and-a-half-thick New York strip steak, it represents the essence of local parrilla, simple and bold. That picture looks delicious so reading the article just made it impossible not to get hungry. Great read. Uh-huh i get very hungry 🙂 and it makes me want to to Argentina again. Thanks for the reminder. This page rendered in 0.65 seconds.